I have showed you how to find color in your compositions. Today, I share three photos taken when I choose color as the main part of the composition. 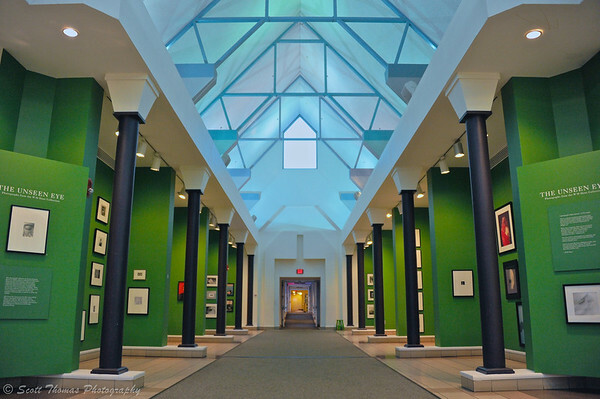 International Museum of Photography and Film exhibition hall at the George Eastman House in Rochester, New York. Colors enhance the leading lines and geometric shapes of the hallway. Nikon D700/28-300VR, 1/60s, f/3.5, ISO 1600, EV 0, 28mm focal length. I know…you think I first spied the leading line and shapes in the International Museum of Photography and Film exhibition hall at the George Eastman House. It was the colors I first noticed. It is the color which grabs you first before the geometric attributes take you into the photo. 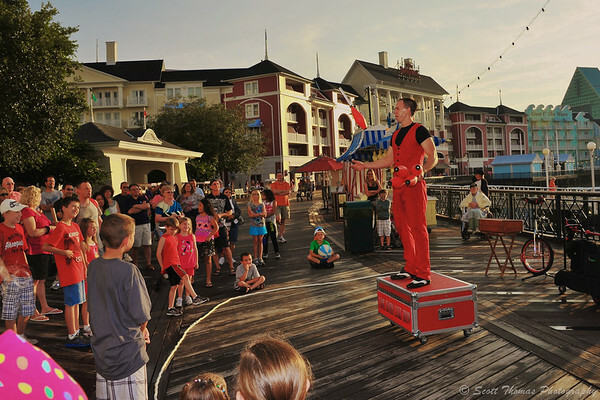 The Cool Hand Luke Juggling Show entertaining guests on The Boardwalk in Walt Disney World, Orlando, Florida. Nikon D700/28-300VR, 1/250s, f/11, ISO 200, EV 0, 28mm focal length, fill flash. Besides his humor, Cool Hand Luke stood out in front of Disney’s Boardwalk Resort with his brightly colored costume and juggling pins which contrasted with the natural tones of the resort’s buildings and wooded boardwalk. To further enhance his appearance, I placed him in the right third of the frame where your eyes are lead to first before exploring the rest of the scene. Taveta Golden Weaver (Ploceus castaneiceps) bird on the Pangani Forest Exploration Trail in Disney’s Animal Kingdom. Nikon D700/28-300VR, 1/80s, f/5.6, ISO 3200, EV +0.3, 300mm focal length, cropped. 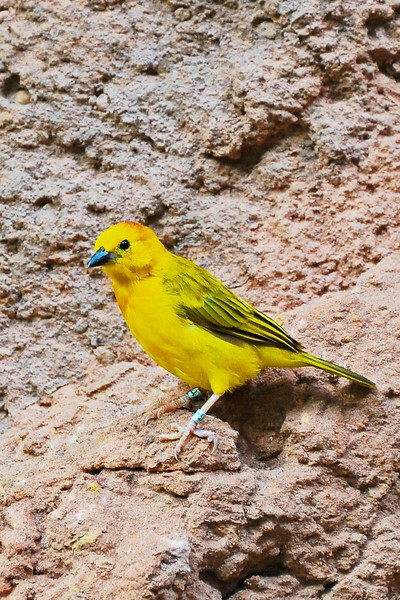 A yellow Taveta Golden Weaver (Ploceus castaneiceps) bird on the Pangani Forest Exploration Trail in Disney’s Animal Kingdom posed nicely for me against the natural background. The contrast of the yellow bird pops right out at you against the rock. This is my submission for the assignment on Color Composition. This entry was posted in Assignments, Photography and tagged 28-300mm, bird, blue, boardwalk resort, color, composition, cool hand luke, disney's animal kingdom, entertainer, fill flash, george eastman, green, house, juggler, juggling, museum, new york, nikon D700, red, rochester, vr, walt disney world, yellow. Bookmark the permalink. Beautiful shots, Scott, the picture from the Eastman house is especially striking! That one did pop out at me as I was going through my photos from the past year. The green and the blue was what I remember first when I saw this hallway. Then the rest. Great pics Scott! I agree with Barbara, the Eastman house image is fantastic. I haven’t seen the Cool Hand Luke juggler before on the Boardwalk, now I have another thing on my list to explore. That is the great thing about Walt Disney World, there is always something new to discover. This was the first time I saw him. They have a magician on the Boardwalk, too. The Boardwalk area comes alive just before sunset each night. All the games open up and the performers come out. Really nice and useful article about Using Color in Composition..Today i am happy after reading this post thanks. I”m happy, you are happy, Asha. Very cool and colorful choices Scott. Perhaps it is no surprise that my favorite is the bright yellow bird, but I do also really like the bold green and blue of the Eastman House. Thanks again for the assignment and happy Thanksgiving! Love the first image Scott. Outstanding. You did a most lovely job of astounding us with your color, Scott. That first one made me blink it was so bright and bold and beautiful! (The others were colorful as well.) Hope you and your family had a wonderful Thanksgiving.